An homage to the infamous Heavy Rain "Shaaaaaaun" glitch. Adds a configurable hotkey (X by default) that triggers 10 different, randomly picked "Shauns" for each gender edited from vanilla dialogue lines, and also adds additional lines when the Player is in conversation with NPCs. I've already finished making this mod when I realized there's another file here on NexusMods with pretty much the same functionality. 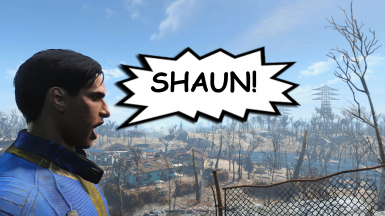 So instead of throwing out and not uploading my version, here's a shout-out for the Holla Atcha Boy - Yell Shaun mod by Emilio G! Please make sure you check out their version too, and use the one that suits you the best! HAPPY APRIL FOOLS' DAY 2017! Extract the contents of the rar file to your Fallout 4 Data folder and enable PressXtoShaun.esp using a mod manager or manually. The mod uses the keyboard key X by default. If you want to change that, open Data/PressXtoShaunHotkeys.ini with a text editor, and change X to whatever you prefer. Check out registrator2000's article about List of Possible Keybinds for more details. 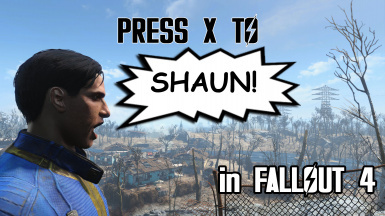 Press X to Shaun. Or press any other key you've set instead of X within PressXtoShaunHotkeys.ini. By default X is for auto-walk. It is also used in the character creation menu for changing the gender of the protagonist. Changing the mod to use another key instead of X is absolutely possible, the method is detailed in the 'How to Install' section.